Angelos Kokkinis might have grown up on a mountain, but he started climbing at the University of Missouri–St. Louis. 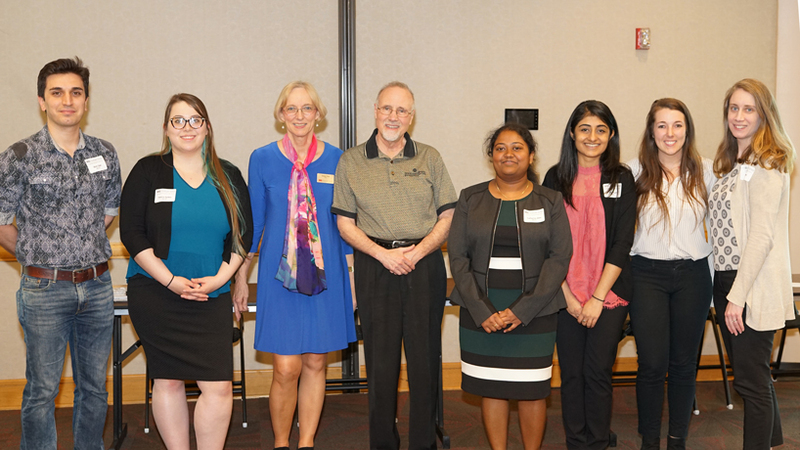 The UMSL/WUSTL Joint Undergraduate Engineering Program student hails from Greece’s Thessaloniki region, specifically the small town of Chortiatis, which is situated about 2,000 feet above sea level on Mount Chortiatis. 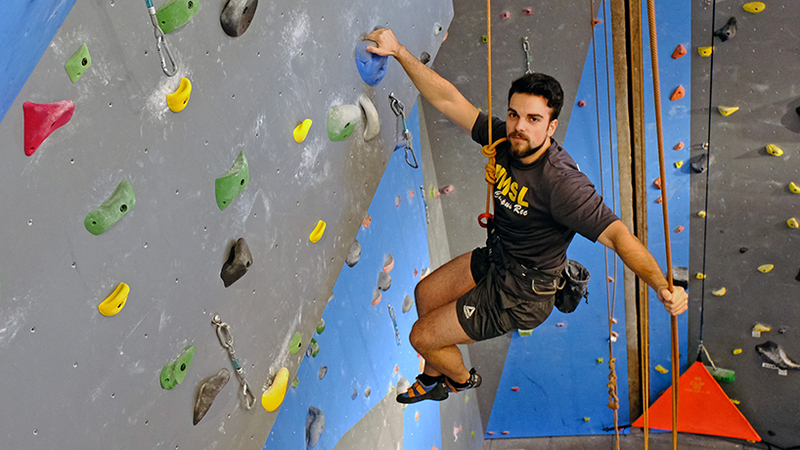 When Kokkinis came to UMSL, he started working at the Recreation and Wellness Center and found himself drawn to the Climbing Center. Before long, he started working there. Soon, he started designing the different rock wall configurations. UMSL’s Climbing Center contains areas for top rope climbing, where the climber is secured by an anchor at the top of a 33-foot wall, and bouldering, un-roped climbing done on a 12-foot wall over an area cushioned against falls. It also sports two automatic belay devices and a thick rope for climbing. Anywhere from 10 to 40 people a day climb in the rec center, depending on the time of year, and the frequency at which Kokkinis and others switch out routes depends on use and how often climbers request a change. At the very minimum, he will put up a new route once a month. The process starts with the top-down removal of the old route. After selecting difficulty, Kokkinis maps out the route and installs the holds. He grades the routes on difficulty based on his climbing experience, and one of his goals is to ensure consistency among the various routes in the climbing area. Certain signature features define Kokkinis’ top rope routes and problems, as the shorter paths on the bouldering wall are called. He likes to start with a large, interesting hold and, from there, conceptually develop the whole. Though others help, he is the main route setter. Kokkinis is on track to graduate in December 2019 with a degree in electrical engineering, so he has about a year to pass on his trade. He started his undergraduate work thinking that he would study physics and computer science but soon realized that the first few years of study were indistinguishable from the engineering program and decided to switch. Kokkinis discovered UMSL thanks to his middle and high school education at Anatolia College, an American-founded school in Pylaia, Greece. 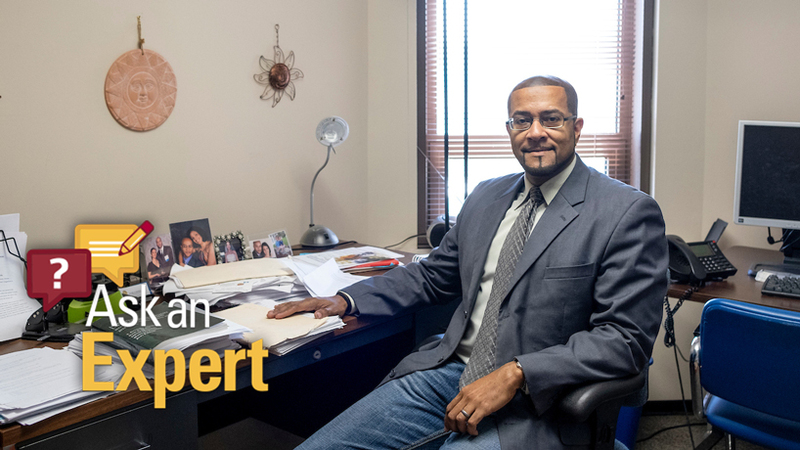 He felt included in the community at UMSL right away because of the International House. Aside from school and work, Kokkinis enjoys understanding the mechanics and upkeep of his car, which is part of what attracted him to engineering in the first place, as well as being outdoors. He occasionally climbs outdoors, and he encourages anyone interested to come try it out for themselves, by take a climbing course or stopping by to chat.